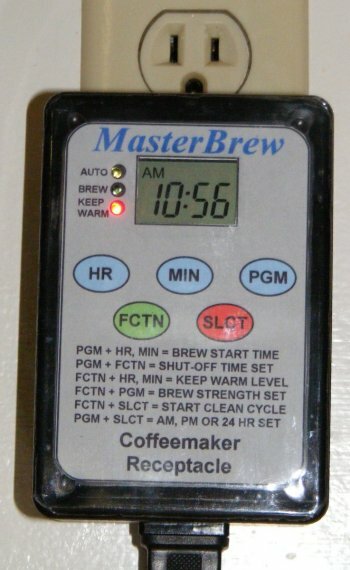 Here are the Benefits and Features for the MasterBrew Coffeemaker Control Module. Plug the MasterBrew into a wall outlet. Plug any brand of 2, 4, 8, 10 or 12 cup manual switch coffeemaker into MasterBrew and turn on the manual ON/OFF coffeemaker switch. The MasterBrew will control the coffeemaker and give you all of the advanced, features of very expensive coffee makers, and even some, Patent Pending, features not available on any machine. 1. Automatic Brew start in the morning. 2. Works with any brand or size of Coffeemaker with just a manual ON/OFF switch (Lowest cost). 3. If Coffeemaker needs replaced, just plug in new one. Saves cost of expensive built-in electronics. 4. Coffee stays fresh tasting for up to four hours with ten lower KEEP WARM (Heater Level) settings. 5. Five Flavor Levels from Regular (Full Pot) to Strong (Half Pot - ideal for half a pot of coffee or less). 6. Automatic shut-off, immediate (for Iced Tea), 1, 2, or 4 hour to fit your lifestyle. (just add a pot of white vinegar and select automatic Clean Cycle). 1. Four-digit LCD display with “AM”, “PM”, “BREW” indicators. 2. “AUTO” (YEL), “BREW” (GRN), “KEEP WARM” (RED) LED indicator lights. 3. Single Operation “SELECT” push-button, “AUTO”, “BREW”, “WARM”, “OFF” sequence. 4. HOUR, MINUTE, BREW time set push-buttons. 6. Five Flavor Levels from FULL POT to HALF POT (“FL:FP”, “FL: 1", “FL: 2", “FL: 3", “FL:HP”). 7. Selectable, AM-PM or 24 hour time format. 8. Variable “HEATER LEVEL” of 0 to 10, (“HL: 10"), 0 = room temperature, 10 = thermostat limit. 9. Blinking “KEEP WARM” light shows when coffeemaker needs cleaning. 10. Automatic Self-Cleaning cycle (“CLn” + ���), with auto shut-off (“donE” + ���). 11. Audible annunciator (���) for mode select change. 12. Permanent EEPROM memory remembers all settings except for current time. The estimated cost for this module is $20 to $30 retail. Please send inquiries per contact information above.